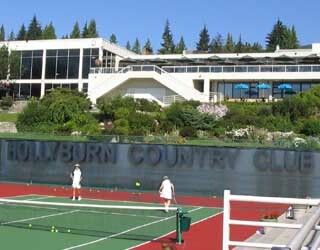 Hollyburn Country Club will play host to the Odlum Brown Vancouver Open August 1-7, 2005. Qualifying begins Saturday July 30. The Open is an ATP tour Men's Event with US$100,000 prize money and an ITF Women's Event with US$25,000 prize money. Hollyburn is no stranger to hosting big events. They hosted the Federation Cup in 1987, top left photo, and Davis Cup play in the early 90's, when Canada took on Sweden and Austria, second left photo. Hollyburn's top two courts have been revamped, left photos, and transformed into one large court with stadium seating to accommodate 1000 people. The rest of courts are being fixed up with the addition of grandstands. The event gives local players, including Philip Bester (North Vancouver), Graeme Kassautzki (Vancouver) and Kamil Pajkowski (Burnaby) the opportunity to play in their first professional tennis tournament. Over 140 professional players from around the world will be playing in this tournament next week.